This is the most famous white wine district of the Veneto region producing wines such as the Soave DOC, Soave classico DOC, Soave classico superiore DOCG and the Recioto di Soave DOCG. The Soave zone is located in the eastern Veronese area, halfway between Verona and Vicenza between the Valle d‘Illasi and the Val d’Alpone. The heart of the wine production area of the Soave “ the classical zone” consists of the municipal territory of Soave and Monteforte d’Alpone. 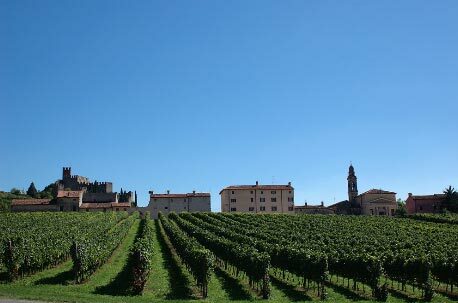 In Soave the landscape is dominated by the beautiful, impressive and perfectly preserved Scaligeri castle. Inside the castle one can still see the Ghibelline crenellated wall divided by 24 towers which surrounds the historical centre of Soave. Inside the walls there are nice civil buildings such as the thirteenth century palace of Justice, the palace San Bonifacio, the palace of the Captain and the Cavalli Palace in gothic Venetian style. In the surrounding areas there are nice towns like Colognola ai Colli, Illasi, Cazzano di Tramigna and Ronca‘, where it is possible to see luxurious aristocratic Villas such as the Villa Perez-Pompei in Illasi and also nice churches and palaces. This area is also covered with century-old olive trees, which thanks to their position, altitude, climate and the nature of the soil in, which they have their roots, produce the precious olives with which the extra-virgin olive oil of the Veneto Valpolicella area is made. This area is also famous for its Monte Veronese D.O.P cheese produced exclusively with cow’s milk coming from the Lessinian mountains. You can see cheese-making techniques at the cheese factories in Soave and Ronca’. 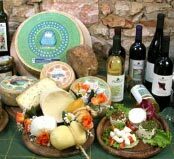 The “Monte Veronese Cheese Festival” has been held on the second Sunday in May since 1990. One of the tastiest products from this area is the “Verdone nano” variety of peas from Colognola ai Colli. The peas are used in several recipes such as “Lasagne with peas” and “Rice with peas”. The Pea Festival is held during the third weekend in May in Colognola ai Colli. These vegetables are such an important resource for the town that they appear in the carnival masked processions as Re Biso (King Pea) and Queen Lasagna. The black cherries from Cazzano (mora di Cazzano) are famous worldwide. In the entire Soave area “ soppressa”, a salted meat made of roughly minced pork and seasoned with spices, salt, pepper and garlic, can be tasted. This product is in the process of obtaining a D.O.P certification of origin.